Earn Money with Acceza’s Affiliate Program! Acceza web hosting affiliate marketing offers the best internet affiliate marketing facilities to give you an opportunity to earn unlimited money with your talent and dedication. Get $10 and 10% Commission on Each Qualifying Signup! Acceza offers easy and maximum earnings with zero investment. We offer payout at a high commission rate in monthly basis. Please take a look at the circle below for better understanding. Acceza’s referral tracking log system helps you to track the referral opportunities daily and regularly. 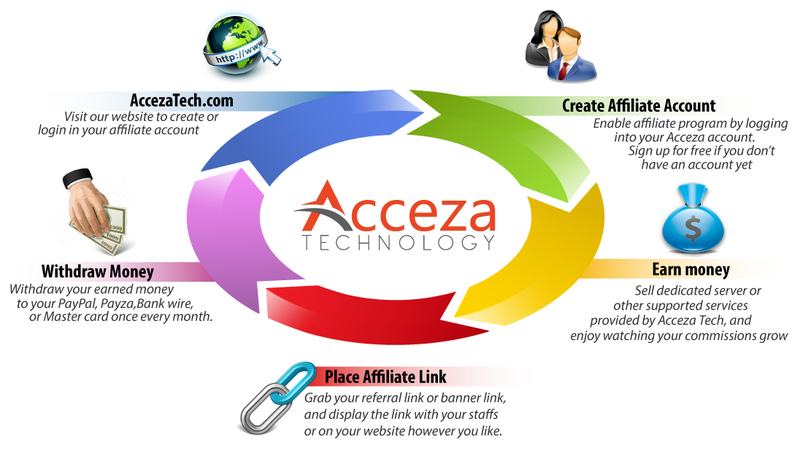 Acceza affiliate marketing program helps you to track your earnings based on device, cookie, and IP in detailed report.